How to decorate a downtown condo in an industrial sophisticated style. Furnishing a condo can be challenging. If you want a sophisticated look, with good looking art, lamps, accessories, rugs, and furniture, consider an interior design firm. They’ll insure you get unique pieces in the right size & scale, quality, and colors for a stylish look! It’s difficult to know how items will look (in their actual setting) when you buy from photos or catalogs. Often once they arrive homeowners realize they bought the wrong size and scale, or they aren’t happy with the quality. A designer can help you avoid those issues. With the before and after photos below, we’ll feature interior design tips to give your downtown condo a sophisticated style. And just do we mean by sophisticated? Well …. everyone’s version is different, since it’s a matter of opinion, one person might say classic, another might say stylish, or up to date, or cultured, coordinated and pulled together, or not trendy. See the before photos, the prior designer used a busy pattern 4 places: in the art, the rug, the pillows and the drapes. These busy patterns were strong, they competed with the brick, making it hard to appreciate the natural beauty of the exposed brick. The new solids and subtle art allow a soothing “less busy” look. A subtle or serene environment is nice to come home to after a hectic busy day at work! When decorating a downtown apartment, consider window treatment ideas that are timeless, such as tone on tone fabrics, in order to achieve a sophisticated style. For art, consider large contemporary art, like the local art from Greensboro, NC below. And when possible, have the designer display the actual art & fabric bolts in the room, rather than trying to visualize from swatches or photos. Below before – the primary color tones of blue red & yellow were updated to more subtle art, since this dining room area is small. The “Jazz man” art is a tall vertical to accentuate the nice tall ceilings. Think Function! We added seating by the balcony, for a great view of the city! Our contemporary black leather chair (below) allows the client to enjoy his downtown city view! Our linen drapes compliment the exposed brick. Before – the busy patterned drapes competed with the beauty of the charming brick (which by the way, was original to the building). For window treatment ideas, it’s helpful to spread out fabric by the bolt, so you can visualize how it will look in the room. Don’t forget bar stools! Stylish bar stools add so much to a modern sophisticated style. In the condo below, the dark wood of the cabinets is repeated on the bar stool legs. The ivory leather compliments the white quartz counter tops. Cocktail table – made of galvanized steel, rustic wood & iron – this piece adds to the industrial style we wanted. Lamps – One is an actual part of a tree trunk & one is concrete. They both add to the industrial style. Below, our masculine distressed wood bed replaced the sleigh bed, and made the room feel larger. This new bed is an industrial style! We provided nightstands with ample storage. A fiddle leaf fig or palm tree can provide the benefit of bringing the outdoors in! This is nice in a downtown condo, to bring in a touch of nature. 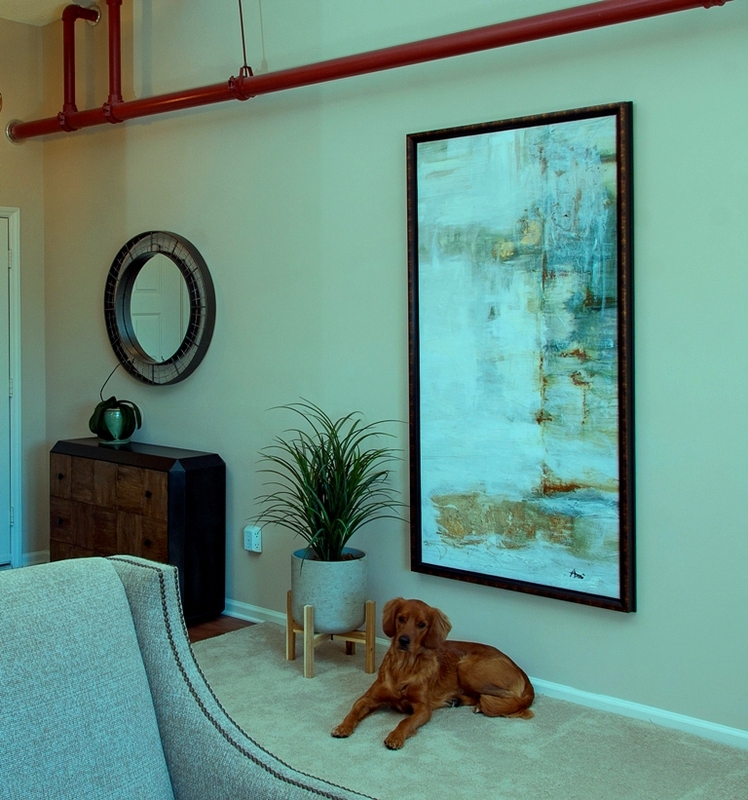 We hope these before and after photos gave you some design ideas for achieving a sophisticated style in your downtown apartment or condo! A sophisticated look is achieved with tone on tone fabrics and rugs, natural elements such as steel, wood, concrete, and aluminum. We hope you’ll comment and tell us how you achieve a sophisticated style in your decorating. Happy decorating! Print versus solid, what fabric is best? What type indoor tree in my living room? 7 designer tips for greenery. Great job on the downtown condos! My friends and I all live downtown Winston-Salem and could use your help.